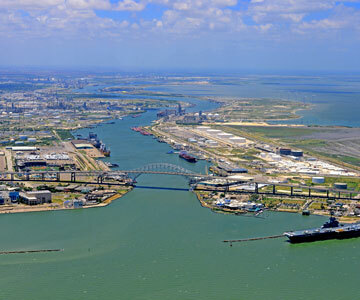 With a straight, 47’deep channel and strategic location on the western Gulf of Mexico, Port Corpus Christi provides quick access to the Gulf, the United States inland waterway system and the world beyond. The Corpus Christi Ship Channel extends from the Gulf of Mexico, through the jetties in Port Aransas, Texas and across the Corpus Christi Bay. The channel serves Port Corpus Christi, Harbor Island, Ingleside and extends into the La Quinta Channel. The channel has a draft of 47’, authorized and permitted for 54′. Port Corpus Christi has actively taken measures to deepen and widen the ship channel to accommodate larger vessels and enhance efficiencies. Immediately following the completion of the 47’ dredging in 1989, Port Corpus Christi applied for authorization to deepen to 54’ and widen to 530’. In 1990, the U.S. Congress authorized the Corps of Engineers to begin investigating the possibility of deepening in order to accommodate larger vessels, increase shipping efficiency, and enhance navigation safety. The Corpus Christi Ship Channel Improvement Project is the Congressionally authorized project to deepen and widen the Port’s 47’ channel to a depth of 54’ from the Gulf of Mexico to the Viola Turning Basin in the Inner Harbor, and to extend the existing 47’ La Quinta Ship Channel 1.4 miles at a depth of 43’ to the Port’s La Quinta Multi-Purpose Facility, which was completed in 2012. The project was approved in 2007 under the Water Resources Development Act.Port Corpus Christi has taken steps toward launching the $350 million project through the approval of various contracts for testing, research and engineering services. 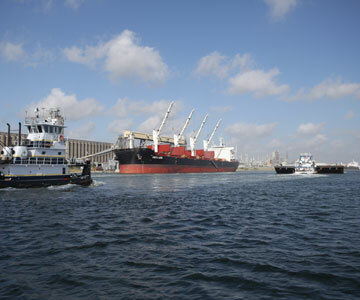 Learn more about the Corpus Christi Ship Channel Project.